Solbiate Olona (VA), 10th November 2016. 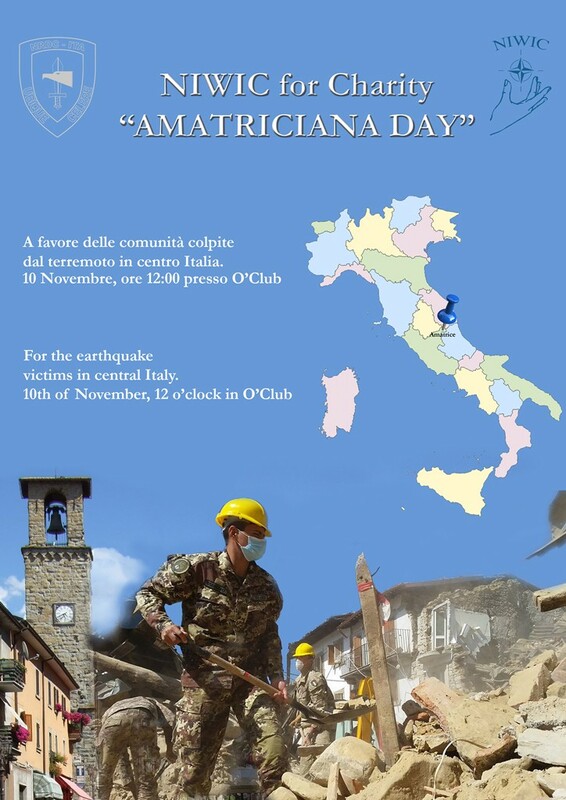 Three months after the August earthquake hit central Italy, NRDC-ITA Women’s International Club (NIWIC) has organized an “Amatriciana Day” at Ugo Mara barracks. The International Staff serving at NRDC-ITA had a taste of “Amatriciana bucatini” donating part of the income and part of NIWIC funds to the Italian Civil Protection Department. NIWIC is a recognised voluntary membership association within the NATO Rapid Deployable Corps Italy Morale & Welfare programme. Every spouse or partner of a member serving in this HQ can participate in our activities. NIWIC routinely organizes several activities and multinational events in order to bring together the various nationalities involved in NRDC-ITA by fostering good relationships and mutual understanding. Examples are fund-raisers for charitable purposes, Italian conversational classes, a Christmas Fair each year, International Coffee, cultural trips, cookery demonstrations, visits to art galleries, museums, villas, gardens, local markets and the like.